Size: 9 by 12 Inch. 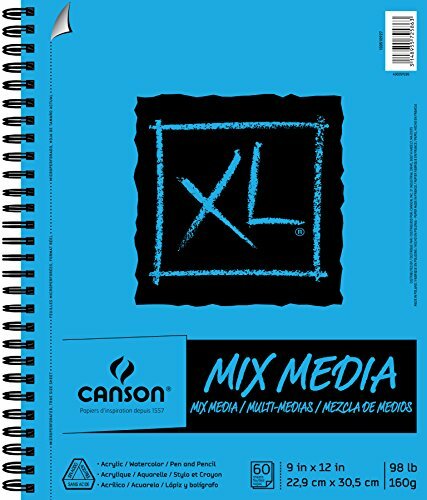 Canson XL Mix Media Pads were developed as the answer to the demand for a heavyweight, fine texture paper with heavy sizing for wet and dry media. This paper can be used for: sketching, drawing, light washes of ink and watercolor, collage, journaling, and more. It has quickly become the most popular paper in the Canson paper family. Mix Media paper erases well and blends easily. The wire bound pads have micro perforated, true size sheets. These pads were developed in consultation with art professors and combine performance with value for the art student. These pads contain 60 sheets of 98 pound/160 gram paper, acid free, 9 x 12 inch paper.